The first and the only one of the kind! US teens and young adults will build confidence and leadership by teaching Science and English to Chinese children. Supported and sponsored by The Guangdong Society of Education and Guangdong Science Center, the joint-venture summer program invites you to travel to China at a fraction of the cost! Sino Language & Beyond education team warmly presents this unique and inspiring International Youth Maker Summer Camp to US teens and young adults to experience the country first-hand and up-close. You will be a leader in the activity-based summer camp! As a Counselor-in-Training, you and your peers from the US will assist the Chinese children to learn STEM and do hands-on projects, while practice leadership techniques and skills in communication, group management, decision-making, and conflict management. With a unique topic each week, the summer camp builds a rich and colorful atmosphere for you to experience the world of science with the local Chinese children and staff. At the same time,greatly enhance your cultural understanding and Chinese language skills. 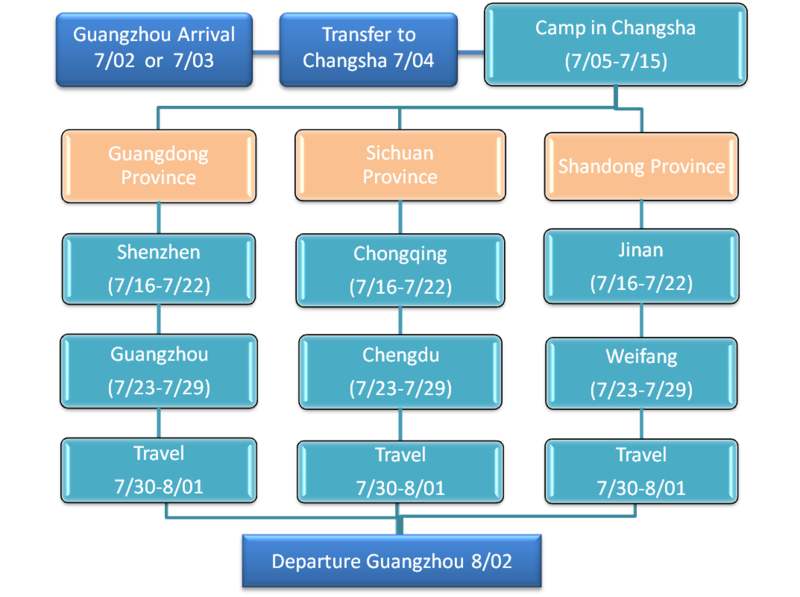 (see a route chart below under Dates and Themes) First 10 days in Changsha, then go to the route of your choice for two weeks. You will be a leader in the camp! You will act as a Counselor-in-Training and assist the master teacher. Your trainer will take you through the normal camp routines while demonstrating and discussing effective leadership techniques and skills in communication, group management, decision-making, and conflict management. Then you and your peers from the US will lead a group of Chinese children, at the same time you will get anytime support from the camp management. $500. As the program is non-profit, it is extremely affordable to travel on it to abroad for three weeks! There hardly will be a 2nd opportunity like this that allows you travel at this minimum cost and have so much fun and rich experiences! This fee includes everything in China! Scholarship is available for qualified student who needs financial assistance to participate. Call for details.